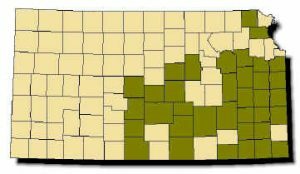 Range: Found from Atchison and Brown counties in northeastern Kansas southwestward to Cheyenne Bottoms and south to Barber County. Description: Harmless. Scales keeled. 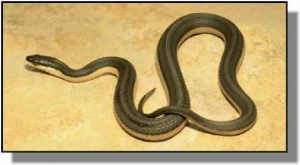 Body is dark brown or slate gray, with cream-colored or yellow stripes along the sides of the body just above the belly. Belly is cream or yellow with two dark stripes. In older females, the belly may be dark. Young look like miniature adults. Habits: Occurs along the margins of mud-bottom marshes, oxbow lakes, rivers, and streams; particularly likes roadside ditches abundant with crayfish. Active from late April to October, this snake breeds in the spring and an average litter of 16 young are born July–September. Feeds almost exclusively on crayfish.